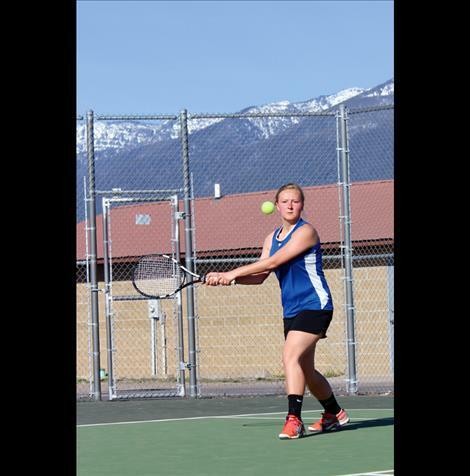 MISSOULA - The St. Ignatius Bulldogs brought home a fourth place doubles finish from State Tournament this past weekend that was held in Missoula. Due to rain, the boys played all matches indoor at the Peak Racquet Club. The doubles team, made up of seniors Nathan Doll and Andrew Esslinger, started out strong in winning their first two matches. They defeated Valley Christian 6-1, 6-0 and Libby 6-3, 6-0. For their third place match, the pair played Libby’s number one doubles team and came up short. Doll and Esslinger lost the first set 1-6, but with grit and determination battled back to win the second set 6-3. According to Head Coach Kimmi Ashley, the pair had momentum on their side going into the third match and played well; however, the Bulldogs came up short losing 7-10. This then put Doll and Esslinger in the consolation rounds, but still guaranteed a State placement. In the consolation, the pair started out strong against Ronan’s number doubles team, Blevins/Rouiller, and won the first set 6-4. A lapse of mental focus lost them the second set at 0-6, according to Ashley. 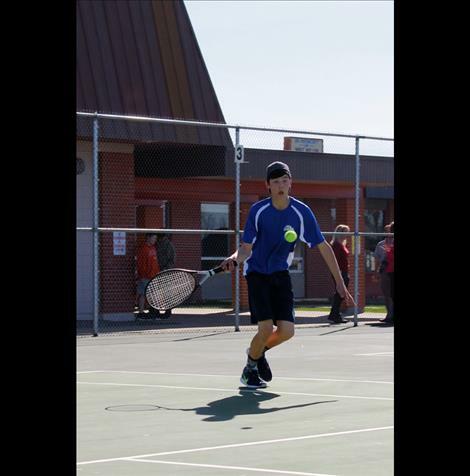 “With a little pep talk from their coaches and determination in their play, Nathan and Andrew came back to win the third set tiebreak at 10-6,” Ashley said. The win put them in the match for third and fourth place. The doubles team continued to fight and came up against a tough Bigfork doubles team, who had cleanly defeated them twice in the regular season. 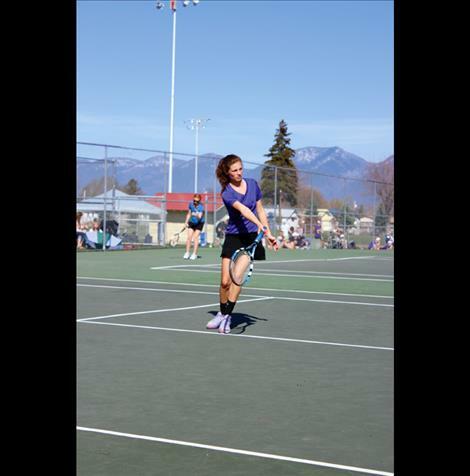 “Nate and Andrew played their best tennis of the season against the Bigfork team,” Ashley said. According to Ashley, high quality points were played and it came down to getting serves in and who would win it at the net. Unfortunately, the past State experience and more years of playing together was an advantage for Bigfork. St. Ignatius lost 5-7, 6-3, (6-10). St. Ignatius also had single players Tim Van Elst and Warren Castor competing. “Castor is a young sophomore player who improved with every match during the season,” Ashley said. Unfortunately, even though he was playing good tennis, he came up just short of losing to Libby 5-7, 4-6 and Loyola 1-6, 4-6. “Looking for Warren to come back strong next year and hopefully get in some off-season work,” Ashley said. On the girl’s side, St. Ignatius had Daisie VandeBos who placed second at the previous weekends Divisionals and Alyssa Rith who had placed third. Both girls lost out in the first two rounds. VandeBos lost 3-6, 1-6 to Fairfield and 3-6, 1-6 to Whitehall.Rith lost 1-6, 0-6 to Troy and 0-6, 1-6 to Choteau. “A case of nervousness seemed to be the biggest factor in both girls games,” Ashley said. POLSON – From 2006 to 2016, the Lady Pirates have dominated the Western A Divisional Tournament. After topping off their tenth Divisional win this last weekend, the Lady Pirates continued to have a 19 - 0 undefeated season. Seniors Molly Congdon and Mollie Lemm went head to head in the single finals, both fighting for the title of Divisional Champion. The two battled back and forth, but it was Congdon taking the match 7-5 and 6-4. In doubles, Lady Pirates Cassie Carlyle and Shawna Lenz defeated teammates Olivia Hewston and Kyler Lundeen for the third place trophy. However, the win didn’t come easy for Carlyle and Lenz. The pair lost the first set 3-6, but fought back to win the next two 6-1 and 6-2. The Lady Pirates are looking forward to continue their winning streak at the State A Tournament May 26-28. Pirates double team Quaid Harlan and Colin Kenney defeated Whitefish in the semifinals to play against teammates Cadis Chowning and Matt Sitter in the double finals. Due to an injury, Harlan and Kenney took the number one title. As a team, the Pirates took second place to Whitefish. First Round - John Moore, Pol, def. Jacob Emery, Stevi, 6-3, 6-4; Nathan Fauth, WF, def. Chris Howell, CF, 6-0, 6-0; Jaron Morgan, Pol, def. Juan Toro, Stevi, 6-1, 6-0; Eric Holdhusen, WF, def. Noah Breneman, Stevi, 6-1, 6-0; Carson McDaniel, Pol, def. Caleb Fleury, CF, 6-2, 4-6, 6-2; Thomas Carloss, WF, def. Kabe Forman-Webster 6-0, 6-1; Chris Howell, CF, def. Juan Toro, Stevi, 6-4, 5-7, 6-4; Caleb Fleury, CF, def. Noah Breneman Stevi, 6-3, 6-2. Quarterfinals - Max Smyley, WF, def. John Moore, Pol, 6-0, 6-0; Nathan Fauth, WF, def. Jaron Morgan, Pol, 6-0, 6-4; Eric Holdhusen, WF, def. Carson McDaniel, Pol, 6-2, 6-1; Colton Belcourt, Stevi, def. Thomas Carloss, WF, 6-3, 6-1. Holdhusen, Wf, def. Colton Belcourt, Stev, 6-4, 6-1. Championship – Smiley, Wf, def. Holdhusen, Wf, 6-2, 6-2. Third place – Belcourt, Stev, def. Fauth, Wf, 6-2, 6-2. First round - Brendan Bulls/Austin Resse, WF, def. Ben Hale/Sam Hale, Stevi, 6-0, 6-0; David Haacke/Askel Sorensen, Stevi, def. Miguel Garate/Jordan Axeburg, CF, 6-2, 6-1; Wyatt Ducharme/Hudson Smith, Pol, def. Sean Hoerner/John Gilk, CF 7-5, 6-1. Quarterfinals - Quaid Harlan/Collin Kenney, Pol, def. Brendan Bulls/Austin Resse, WF, 4-6, 6-2, 6-2; Ryan Brown/Cole Turgeon, WF, def. Brock Denny/Trevor Wick, CF, 6-1, 6-2; Cadis Chowning/Matt Sitter, Pol, def. David Haacke/Askel Sorensen, Stevi, 6-0, 6-2; Chaffin Ross/Ethan Potthoff, WF, def. Wyatt Ducharme/Hudson Smith, Pol, 6-2, 6-3. Potthoff, Wf, 3-6, 6-2, 6-4. Championship – Chowning/Sitter, Pol, def. Harlan/Kenney, Pol, due to injury. Third place – Brendan Bulls/Austin Reese, Wf, def. Ryan Brown/Cole Turgeon, Wf, 6-3, 6-3. Team scores – 1, Polson 54; 2, Whitefish 42; 3, Columbia Falls 19; 4, Stevensville 7. First round - Emily Getz, CF, def. Ashley Eyre, Stevi, 6-0, 6-0; Tessa Nunlist, Pol, def. Paige Sproul, WF, 6-4, 6-2; Janette Kolarzik, WF, def. Erin Bartlett, Stevi 6-0, 6-0; Mollie Lemm, Pol, def. Sammi Mueller, CF, 6-1,6-2; Lilli Szundy, WF, def. Shea McGuinness, Pol, 6-0, 6-3; Molly Schmidt, CF, def. Olivia Yaskus, Stevi 6-0, 6-1; Harley Molchen, CF, def. Brianne Bartschi, Stevi, 6-0,6-1; Marlee Congdon, Pol, def. Holly Hileman, WF, 6-0, 6-1; Paige Sproul,(WF, def. Ashley Eyre, Stevi, 6-2,6-1; Erin Bartlett, Stevi, def. Sammi Mueller, CF, 7-6(5), 6-3; Shea McGuinness, Pol, def. Olivia Yaskus, Stevi, 6-3, 6-1; Holly Hileman, WF, def. Brianne Bartschi, Stevi, 6-1, 6-1. Quarterfinals - Emily Getz, CF, def. Tessa Nunlist, Pol, 6-1,6-2; Mollie Lemm, Pol, def. Janette Kolarzik, WF, 6-3, 6-0; Lilli Szundy, WF, def. Molly Schmidt, CF, 6-2, 7-5; Marlee Congdon, Pol, def. Harley Molchen, CF, 6-1, 6-1. Semifinals – Mollie Lemm, Pol, def. Emily Getts, CF, 7-6 (6), 6-3; Marlee Congdon, Pol, def. Lili Szundy, Wf, 7-5, 6-0. Championship – Congdon, Pol, def. Lemm, Pol, 7-5, 6-4. Third place – Getts, CF, def. Szundy, Wf, 6-3, 6-2. Quarterfinals - Cassie Carlyle/Shawna Lenz, Pol, def. Shelby Spokas/Jackie Westman, Stevi, 6-0, 6-1; Katie Fyall/Anna Peterson, WF, def. Sydney Grilley/Morgan Stenger, CF, 6-4, 6-1; Olivia Hewston/Kyler Lundeen, Pol, def. Allison Enzler/Danielle Haacke, Stevi, 6-1, 6-2; Hannah Madsen/Heather Luedke, WF, def. Natalee Wheeler/Hunter Tamcke, Pol, 6-1, 6-4. Semifinals – Hannah Madsen/Heather Luedke, Wf, def. Olivia Hewston/Kyler Lundeen, Pol, 6-2, 7 5; Katie Fyall/Anna Peterson, Wf, def. Cassie Carlyle/Shawna Lenz, Pol, 6-4, 3-6, 6-4. Championship – Fyall/Peterson, Wf, def. Madsen/Luedke, Wf, 6-3, 6-3. Third place – Carlyle/Lenz, Pol, def. Hewston/Lundeen, Pol, 3-6, 6-1, 6-2. MISSOULA – After winning their Western B Divisional Tournament, the Ronan Maidens and Chiefs were looking to give Head Coach Gordon Cummings one last hurrah at the State B Tennis Tournament. Cummings has been coaching for Ronan Athletics for the past 20 years. He spent eight years as a freshman volleyball coach and 13 years as the tennis coach. Cummings spent his last weekend as a coach in Missoula helping his athletes finish out their strong season. Although the athletes did not finish as they would have liked due to injury, Cummings was happy to have one last coaching weekend. Cummings will be spending his time-off gardening, working with his horse, and traveling with his wife to visit their daughter.